Yosemite Revisited Bam! The trout hit the fly and the sensitive rod jerked. I coaxed the wiggling fish across the river and up onto my rock. Releasing it, I was amazed at how small he was. As a long-time ocean fisherman, I’ve used bait larger than this little fellow. But this was not the ocean. 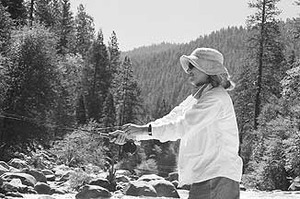 I was fishing the south fork of the Merced River, just inside the park boundary of Yosemite National Park. My trout was a happy result of a morning’s fly fishing lesson during which I’d learned how to hook up the gear, select a fly and tie it on, and cast without whipping the fly off or tangling the mess in a nearby tree. Our friendly guide, Kelsey Ripple, was a patient and helpful tutor who also guides backpackers when he is not working the fishing holes. He was supplied through Tenaya Lodge, an AAA Four-Diamond resort two miles from the south entrance to the park. In addition to fishing, there’s so much to do at Tenaya Lodge it could be a destination resort, with day trips or tours into Yosemite National Park. The upscale resort has indoor and outdoor swimming pools, Jacuzzi, saunas, steam rooms, a fitness center, fine dining, and a spa package. Outdoor activities include horseback riding, boat rides or fishing in nearby Bass Lake, fly fishing, guided hikes and wilderness tours, biking, white water rafting and more. That afternoon, I checked out a mountain bike and enjoyed a pleasant five-mile round trip to Tenaya Falls, mostly a dirt road but following a streamside trail the last half-mile. Near the lodge is the world famous narrow gauge Sugar Pine Railroad, which offers a half-hour ride in open cars through the forest, terminating in a clearing where a real western outdoor barbecue dinner with all the trimmings awaits. It’s a fun evening, but bundle up; it can get cold even in the summer. Tenaya Lodge, as nice as it is, is just a preface to what is considered by many to be America’s finest natural attraction. Yosemite National Park primarily consists of a glaciated valley enclosed by huge granite monoliths. Falls tumble into the valley from snowmelt in the higher elevations and the valley floor is a beautiful maze of trees, green meadows, and a gracefully flowing Merced River. There’re also several groves of giant sequoias located inside the park boundary. While the Tuolomne Grove and the Merced Grove are north of the valley, the popular Mariposa Grove is just inside the south entrance. However, you can no longer drive through the famous Wawona Tunnel Tree, as it collapsed in 1969 under a record snowfall. In fact, you can no longer drive to most of the Mariposa Grove, only to those giants surrounding the parking lot. There’re good hiking trails or the optional tram to take you to the upper grove. About a half mile up the trail is the Grizzly Giant, a monster tree one of whose branches is bigger than any other non-sequoia in the park. Within the next mile are the California Tunnel Tree, the Clothespin Tree, and the Galen Clark Tree. The Wawona Tunnel Tree is at the end of the trail, about a five mile round trip and, at 6,600 feet elevation, about 1,000 feet higher than the parking lot. While it was good exercise, I remember my father driving us through the fallen tree back in the 1940s. From the Mariposa Grove, the first memorable vista of the beautiful Yosemite Valley unfolds at the end of the Wawona Tunnel. Pull off into the parking lot immediately after exiting the tunnel. You won’t be disappointed and the remarkable view extends from the giant rock El Capitan, up through the valley with Half Dome in the distance and Bridal Veil Falls on the right. Accommodations in the Yosemite Valley range from the venerable 75-year-old Ahwahnee Hotel, where rooms start at over $350 a night, to the Canvas Tent Cabins (shared baths) of Camp Curry at $64.00. Camp Curry also has regular cabins and standard rooms. Moderately priced is Yosemite Lodge where rooms run from about $100-$150 per night. The Lodge is walking distance of the valley’s most notable landmark, Yosemite Falls, a remarkable two-tiered drop which plunges 2,425 feet onto the valley floor, making it North America’s tallest waterfall. There are also campgrounds in the park and the old Hotel Wawona that resembles an antebellum estate down near the south entrance. Regardless of the accommodations you’re interested in, it is best to book early, early like the year before. Most in-park lodging is booked a year in advance. For a life-long southern Californian like me, I might add that those tent cabins at Camp Curry can get awfully cold at night. It was quite a contrast following a couple nights of creature comforts at Tenaya Lodge. The Camp Curry experience is for many, the Yosemite experience. This is where for decades visitors gathered each night to see the famous firefalls, a huge conflagration shoved off Glacier Point. This was Yosemite’s most popular program before huge crowds and progress rendered it impractical to continue. Today’s visitors can view a film of “what it was like.” When I was a kid the firefalls remain my strongest and most impressive memory of Yosemite. This time I joined a two-hour valley floor tour in an open-air tram in which a ranger pointed out sights and lore of Yosemite. There’re many activities emanating from the Camp Curry area. I’d signed up for a horseback ride to Mirror Lake and a river raft ride down the tranquil Merced River. This was not an adrenaline pumping Class IV or V rapids, rather a leisurely float where each bend offers yet different views of the spectacular granite rocks, waterfalls and peaks. Yosemite National Park contains some 840 miles of hiking trails, from short quarter-mile walks to Yosemite Falls to the backpacking trails of the high country. The Mist Trail to Nevada Falls and Vernal Falls is one of the most popular. While hikers and bikers are omnipresent, rock climbers from around the world have declared Yosemite their “Mecca.” This rock climbers’ paradise features sheer granite cliffs, from beginner climbing to the massive (3,593 feet from base to summit) El Capitan. Climbers are everywhere clinging to the vertical walls. Tram rangers, in contrast to days of old when they pointed out flora and fauna, now add climbers to their repertoire. The tram would stop so we could see little red or yellow specks high up the granite cliffs. Later that day I saw a drama unfold as I came upon fire trucks with lights blinking, and emergency personnel parked in a meadow near the base of El Capitan. I stopped and joined a number of people all focused on the wall. A helicopter whumped whumped overhead and landed next to me in the meadow. The chopper pilot informed me that a climber had broken his ankle high up and had already been rescued from a team at the top. “I’m going up there now to get him down. I can’t understand people crazy enough to climb these sheer rocks, but I make rescues all summer long,” he said. Some climbers are not so lucky; while thousands successfully climb Yosemite each year, 2.5 climbers lose their lives. Yosemite Valley attracts not only climbers and hikers but also tourists and sightseers from all over world. The vast majority of Yosemite’s 3.8 million visitors come in the summer, most in July and August, again making reservations or off-park accommodations a must. From south Orange County, it’s about seven or eight hours, up I-5, over Cajon Pass, I-99 to Fresno, and up Highway 41 into the park. Another option is to go over the park’s Tioga Pass, a high mountain wonderland of alpine meadows, fishing streams, creeks, lakes, granite monoliths and trails (including the Pacific Crest Trail and John Muir Trail). Tioga Pass is truly one of the most spectacular drives in America. At the park’s eastern entrance, the road drops precipitously down into the small town of Lee Vining at the edge of Mono Lake. From there, head straight south through Bishop and home. That way is a little longer, but less crowded and by far more scenic. I hadn’t been in Yosemite in years although I’d photographed the recognizable huge gap in the Sierras from airplanes. I was there as a kid, and again as a young man when a bear got into the ice chest full of food that we had just purchased. Nowadays, accommodations like Camp Curry have bear lockers to thwart the nightly marauders.